hello dear people, and happy Monday! 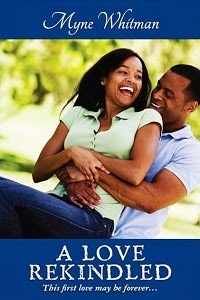 Like I said, I'll be giving out a chapter of A Love Rekindled to the first person to comment. Go ahead and enjoy the real love story for today. T came up to me as I was sorting mail in my job as a casual post office sorter. It was my last week of employment after having worked there on and off over the past five years. He was a permanent member of staff and I didn’t even notice he was standing beside me till he said hello. I looked up and up and said hello in return. He asked how I was doing, and we exchanged names and chatted for a short while before he had to go on his break. I can’t remember what we both said, but I do know we discovered we both went to the same church, even though I’d never seen him there before. After he left, I turned to my friends and said something like ‘I’ve met the kind of person I’d like to marry’ or words to that effect. They asked me if he’d worn a wedding band, but I’d not thought to check. It turned out that even though he wasn’t married, he was dating a girl in church. I didn’t mind, it was nice to be friends with a guy who was being genuinely friendly without any strings attached, and I enjoyed the few more conversations we had before I left Royal Mail later that week. This was in December 1994, a few weeks before Christmas. I was travelling to America for the first time early in the New Year too, and was looking forward to my trip. I had a lovely time while I was away, and when I got back, he told me his girlfriend had broken up with him. I commiserated with him, but I was turning cartwheels on the inside! And so we became good friends, he worked in the transport department at church, so after service, if he was driving, I’d sit up front with him while he made his drops. We chatted nonstop and the more I found out about him, the more I liked him. Eventually after months of platonic friendship, he popped the question in August 1995, and I said yes. I didn’t have an engagement ring, he couldn’t afford the type I’d like, but I didn’t care, I was happy to wait. My parents had liked him from the first moment they met him, and to date, he’s more their son than I am their daughter! We have three lovely daughters, and he takes care of all four of us like royalty. T is genuinely one of the nicest men I have ever met, and I know I am one extremely blessed woman to have married him.